With the first splash of monsoon shower, there is loads of relief from the scorching heat of summer. Rainy season brings with it a sense of fun and frolic especially among the kids and youngsters who love getting drenched in the drizzle. But on a serious note have you ever noticed that in comparison to the other seasons, there is drastic fall in the attendance sheets of schools, colleges and offices? On the other hand, there is so much rush in the clinics, hospitals and nursing homes all across the world. Well, this is because monsoon brings along with it, its own weather induced diseases, which leaves no stone unturned to create menace in human lives. Starting from cold and cough, fevers to stomach infections and diarrhea, people seem to suffer a lot. However, not to worry as in this article I will be discussing with you 13 most common monsoon diseases, their symptoms and ways to keep them at bay. Diseases that churn out of monsoons are a kill-joy. The humid damp weather is just appropriate for the annoying germs like bacteria, fungus to breed. The bottomless path holes, waterlogged roads, muck and the stagnant pools of water become the ideal breeding grounds of these germs. While almost everyone can fall prey to these diseases, it is the mainly the kids, aged people and the other weaker souls who are at greater risk of being victimized. If proper care is not taken, these diseases can often become life threatening, so stay informed and safe from the most common monsoon diseases. Before knowing the remedies, just have a look at the names of the diseases, which tops the most common monsoon diseases list. This will make you more aware and help you in preventing them. Now that you have already known the names, let me give you the details of these diseases, their symptoms and preventive measures. With the festive and the wedding season round the corner, I am sure you all are geared up to have a blast. At the same time, you need to keep in mind, that before the festivity comes the rainy season and that it has already struck the city with vengeance. Now, you are more likely to fall ill unless and until you start taking proper care. Prevention is always better than cure, so start your health care regime to combat monsoon diseases from now onwards. Come let me make your task easier. Have a thorough look at this detailed list of the common monsoon diseases, their symptoms and ways to prevent them. Malaria is a life-threatening mosquito borne blood disease caused by a Plasmodium parasite and tops the list of the most common monsoon diseases. It is transmitted to humans through the bite of the Anopheles mosquito. Once an infected mosquito bites a human, the parasites multiply in the host’s liver before infecting and destroying red blood cells. If there is a lake or pond near your house, then introduce gambusia fish in it. These fish feed on mosquito larvae and can help control the mosquito population. Diarrhea, also spelled Diarrhoea, is the condition of having at least three or more loose or liquid bowel movements each day. The most common cause is an infection of the intestines due to a virus, bacteria, or parasite; a condition known as gastroenteritis. These infections are often acquired from food or water that has been contaminated by stool, or directly from another person who is infected. It may be divided into three types: short duration watery diarrhea, short duration bloody diarrhea, and if it lasts for more than two weeks, persistent diarrhea. The short duration watery diarrhea may be due to an infection by cholera. Avoid fats, sweets, coffee, and milk products until you are completely over the diarrhea. Dengue (pronounced Dengee) fever, mostly common in tropical or sub tropical regions, is a painful, debilitating mosquito-borne disease caused by any one of the four closely related dengue viruses. These viruses are related to the viruses that cause West Nile infection and yellow fever. Dengue fever is transmitted by the bite of an Aedes mosquito infected with a dengue virus. The mosquito becomes infected when it bites a person with dengue virus in their blood. Dengue mosquito typically bites during the day. Because one of five serotypes causes the dengue virus, it is possible to get dengue fever multiple times. However, an attack of dengue produces immunity for a lifetime to that particular viral stereotype to which the patient was exposed. It cannot spread directly from one person to another person. You can prevent the risk of the disease by keeping your surroundings clean and wearing protective clothing. Reduce the mosquito habitat by removing standing water around your house. Some experts say the favourite spots of are below the elbow and below the knee. So try to wear full sleeves dresses and full pants mainly during the day as dengue mosquito typically attacks during the day. They are generally active between the period of August-October and do not breed when the temperature falls. So be extra careful during this time. You could turn to natural repellents like Lemon Eucalyptus Oil, Lavender, Neem Oil and Cinnamon Oil to protect yourself against mosquito bites. Plants like feverfew, citronella, catnip and lavender have mosquito repellent properties. Place them around your house to keep mosquitoes away. Even herbs like garlic, lemongrass, basil, peppermint, rosemary may help. Here’s a detailed remedy to cure dengue fever using papaya leaves. Chikungunya is a mosquito-borne viral disease first described during an outbreak in southern Tanzania in 1952. It is characterized by an abrupt onset of fever frequently accompanied by joint pain. The virus is transmitted from human to human by the bites of infected female mosquitoes. Most commonly, the mosquitoes involved are Aedes aegypti and Aedes albopictus, two species which can also transmit other mosquito-borne viruses, including dengue. These mosquitoes can be found biting throughout daylight hours, though there may be peaks of activity in the early morning and late afternoon. Both species are found biting outdoors, but Aedes aegypti will also readily feed indoors. Less common modes of transmission include vertical transmission, which is transmission from mother to child during pregnancy or at birth. Transmission via infected blood products and through organ donation is also theoretically possible during times of outbreak, though no cases have yet been documented. Use products containing oil of lemon eucalyptus or PMD (p-Menthane-3,8-diol) can be effective. The disease is caused by the bacterium Salmonella typhi and is highly infectious. The bacteria are present in human feces, and a healthy person may fall prey to the disease by consuming contaminated food and water (this is known as the feces-oral route). S. typhi enters through the mouth and spends 1-3 weeks in the intestine. After this time, it makes its way through the intestinal wall and into the bloodstream. From the bloodstream, it spreads into other tissues and organs. Some patients carry the infection in their gall bladder even after the disease is cured. The pathogen is excreted and flies then act as carriers/ vectors, contaminating food and water. However, viral fever occurs during all season, but they are most often during monsoon. Viral fever refers to a wide range of viral infections, usually characterized by an increase in normal body temperature. It is quite common in children and old people due to lowered immunity. Viral fever, as the name suggests, is a condition that is transmitted from one person to another through direct contact with the person’s bodily fluids. When a person coughs, sneezes, yawns or even talks they tend to spray tiny particles of fluid that contain bacteria and viruses from their body. If you are close enough, these bacteria enter your body through your nose or mouth and infect you. Once infected it takes anywhere from 16 hours to 48 hours to turn into a full-blown infection. Drink boiled water or use water purifiers to purify the water before drinking. Vibrio cholerae is the pathogen that causes this deadly disease by infecting the small intestine. With an incubation period of 6-48 hrs, symptoms show quickly after infection. Cholera is highly contagious. It is spread mostly by unsafe water and unsafe food that has been contaminated with human feces containing the bacteria. Flies act as carriers of the disease, which is why the disease spreads faster in areas of poor sanitation. Undercooked seafood is a common source. This disease affects both animals and human beings and is caused by the bacterium Leptospira spp. An animal carrying the leptospira bacteria may show no outward signs of illness. The bacteria live inside the animal’s kidneys and can be passed out in their urine. Humans can get leptospirosis through direct contact with urine from infected animals or through water, soil or food contaminated with their urine. Many different kinds of animals can carry the bacteria, but it is most commonly associated with rats/ mice, dogs and farm animals like pigs, cattle’s, horses and sheep. The disease can also pass through the consumption of contaminated water and contaminated food or by wading in dirty water (as happens in floods) with open wounds. Without treatment, leptospirosis can lead to kidney and liver damage and even death. You should wear adequate protective clothing if you have an occupation where you come into contact with animals (particularly rodents) or sources of contaminated water, such as farming or working with sewers or drains. At the moment, there isn’t a vaccine that protects humans from leptospirosis, but it is possible to vaccinate cattle, dogs and some other animals. Jaundice is the medical term that describes yellowing of the skin and eyes. Jaundice itself is not a disease but it is a symptom of several possible underlying illnesses. Bilirubin is a yellow pigment that is formed by the breakdown of dead red blood cells in the liver. Normally, the liver gets rid of bilirubin along with old red blood cells. Jaundice occurs when your liver does not metabolize bilirubin the way it’s supposed to and there is too much bilirubin content in your system. Jaundice may indicate a serious problem with the function of your red blood cells, liver, gallbladder, or pancreas. Reducing alcohol intake is one of the remedies to prevent jaundice. Phototherapy is the most important treatment for jaundice, especially newborn jaundice. Always take medicines with the consultation of a doctor. Liver cells will undergo extra stress to metabolize drugs and this may result in jaundice. Hepatitis A is a contagious liver infection caused by the hepatitis A virus (HAV). Hepatitis A virus is found in the stool (feces) of people with HAV infection. It enters the body through the mouth after someone handles something contaminated with HAV, or eats or drinks something contaminated with HAV. People usually get hepatitis A by having close contact with a person who is infected, from food or drinks prepared by someone who is infected, or by eating shellfish harvested from sewage-contaminated water. After the virus enters the body, there is an incubation period lasting 2 to 7 weeks until illness begins. Pneumonia is an inflammation of the airspaces in the lung most commonly caused by infections. Bacteria, viruses, or fungi (infrequently) can cause the infection. There are also a few noninfectious types of pneumonia that are caused by inhaling or aspirating foreign matter or toxic substances into the lungs. Pneumonia is generally more serious when it affects older adults, infants and young children, those with chronic medical conditions, or those with weakened immune function. If you didn’t get vaccines against these diseases, then be extra careful. There are a number of pathogenic microorganisms that can affect the stomach and the infection usually extends to neighboring structures, namely the esophagus proximally and duodenum distally. Stomach infections can broadly cause two common conditions – gastritis and gastroenteritis. At times, toxins from infectious agents, mainly bacteria, can cause inflammation without the pathogen infecting the stomach itself. Other infections involving the esophagus and duodenum of the small intestine may also affect the stomach, like is seen in infectious colitis. If you have no other option but to eat out then eat smartly. Choose foods “idli”and “dosas” that are served steaming hot. The heat kills the pathogens and lowers your risk of acquiring an infection. Do not eat under cooked foods, as they are likely to be contaminated with bacteria such as Salmonellaand coli that can cause food poisoning. Monsoon is the season to enjoy the rains, go out for a drive or relish the host and tasty food. But if you do not take proper care of yourself, you may fall ill. The list of common monsoon disease is long, but there is nothing to worry, because with a bit of precaution, these diseases can be prevented. Just be careful of these diseases as a few of them might be life threatening. If you feel weak, do not hesitate to go for doctor checkups and tests. You will get early relief if you diagnose it on the early stages else things might take a more serious turn. 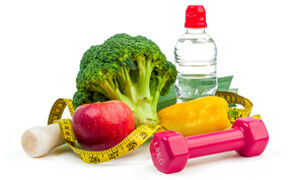 Health is precious, so do not ignore it. 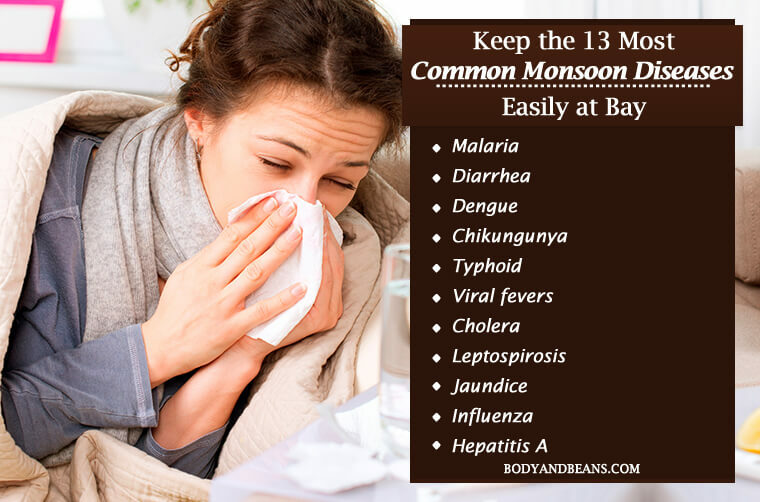 We have already discussed about the 13 most common monsoon diseases, its symptoms and ways to prevent these diseases. A little awareness will help you keep the most common monsoon diseases away. Till then, stay healthy and stay happy.